Hello again fellow scrappers. It's time for another reveal over at Once Upon A Sketch (OUAS). My Toby--our Toby really...ever since you became a member of our family you've filled a void we didn't even know we had. You bring sunshine & laughs to our otherwise mundane lives. Your 'childlike' ways never cease to surprise or amaze us--and we'll never figure out how such a small dog can have such an enormously loud bark! You're our Toby--but I see you as 'my' Toby. I was the first one to hold you as a puppy & look into those big brown trusting eyes. When I look at you today, I see a grown dog with eyes that are still trusting, but are now also filled with unconditional love, devotion & loyalty. You belong to our family, but to me you'll always be my wet-nosed confidant, my undercover furry friend...my sweet little Toby. 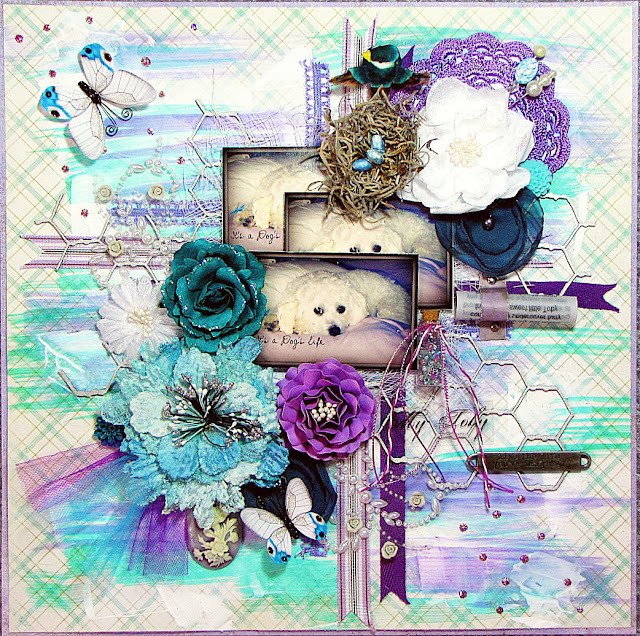 I've used doilies, flowers, mushroom birds, nests & lots of ribbons on this page. In fact, most of my background is made up of ribbon. All ribbons & twine seen on this page were sponsored by Scrapbook Fantasies. The gorgeous light blue flower is by Manor House Creations--I'm loving their flowers more and more lately! I've tucked a bit of aqua & purple tulle underneath my large flower to soften the page a bit. The butterflies are new designs that will soon be available in my Etsy shop. So keep an eye out for them! The honeycomb chippie is by Dusty Attic. My title was printed on a transparency, cut out & adhered with clear dry glue. I really liked this one particular metal word band by Tim Holtz that reads: "live the life you've imagined". That would be my Toby. Oh he really does live a 'dog's life'. Eats all he wants, sleeps all he wants--total pampered pooch...even in the photo he's holding a bone that he happily chewed on for hours and hours! The pearl flourishes are by Prima. The small glass vial is from my stash--I've filled it with small beads, also from my stash. Something that has become a trademark with my pages lately is how I store my journaling. It's stored in the form of a scroll as shown here. If interested on how I go about making this scroll journaling--you can find a tutorial for it here. The background is composed of gesso with random smears of Frozen Lake & Blitzen glimmer mists. The gesso was applied with a small spatula while the glimmer mists were applied with a paint brush. I didn't spray the mists directly onto the paper this time. Instead I sprayed them directly onto my Ranger Non-Stick Craft Sheet & then dipped my paint brush into the ink & painted away. I've also tucked a bit of cheese cloth behind my trio of pictures. Thanks for stopping by! 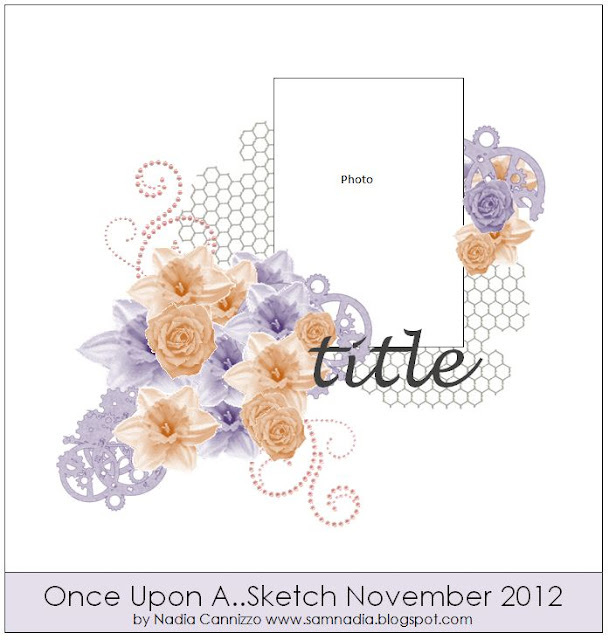 Make sure you visit the OUAS blog to see how the other talented DT's interpreted this challenge & sketch. Pretty colors Kay. Did I ever tell you our dog (growing up) was "Toby"? LOVE everything about this layout! That Toby is one cute pup too! Thanks for sharing!